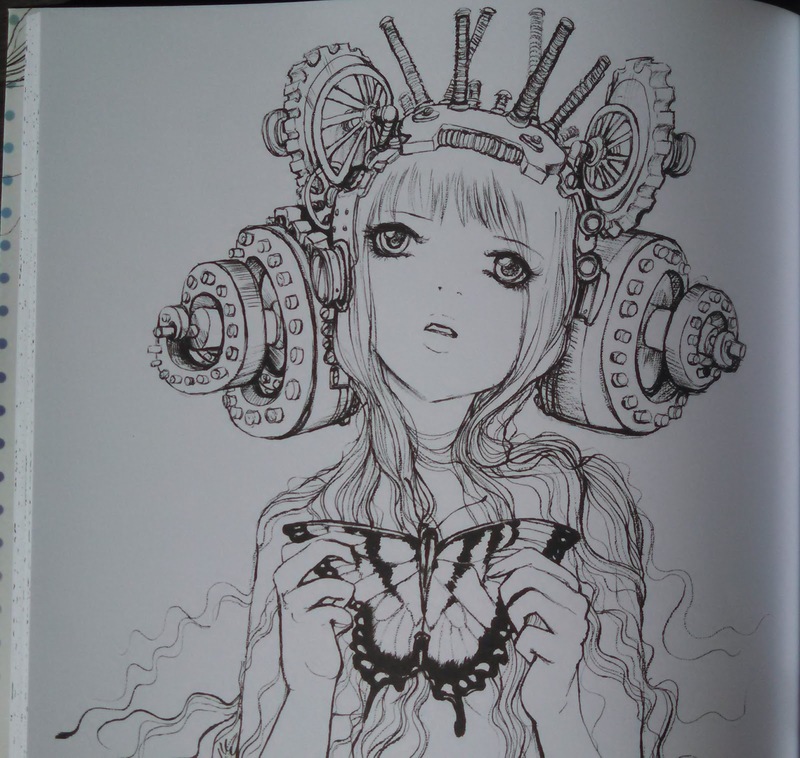 Pop Manga is such a fun coloring book. 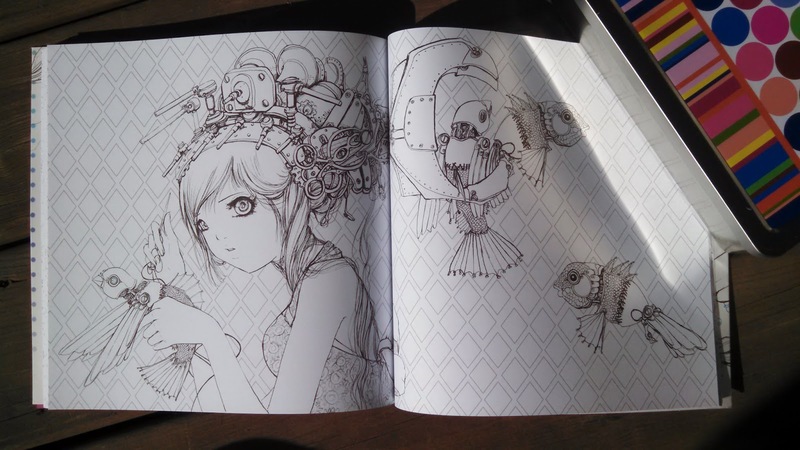 The pictures are very detailed with fanciful drawings. 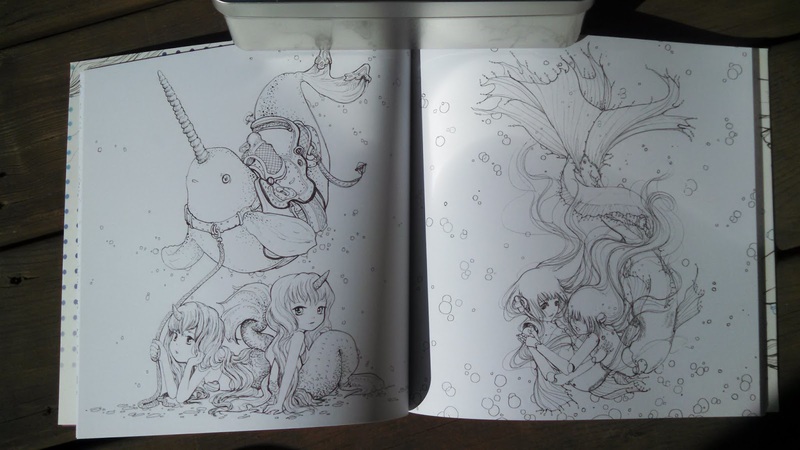 The mermaid and sea creatures are my favorite. My niece loves the robots and gears the most. There are lots of pictures of faces to color which I can't wait to begin. 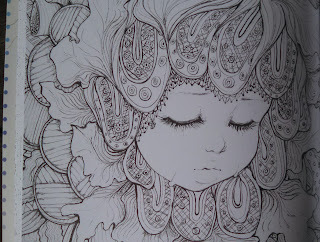 The pictures aren't so detailed that it's tedious to color like some coloring books I've seen. This one has the right amount of detail in the beautiful pictures. 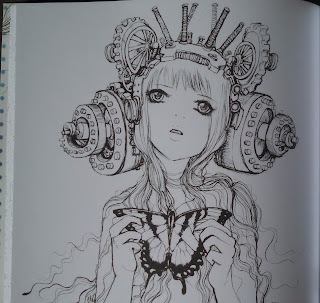 The pages of the book are nice and thick with drawings on both sides of the page. 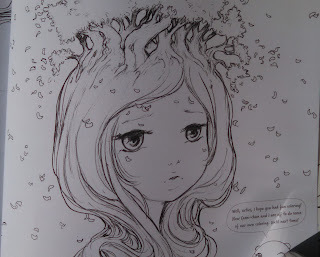 I don't think there will be any problems of ink bleed through or pressure marks onto the other side of the page. The pages also have a nice smooth texture. 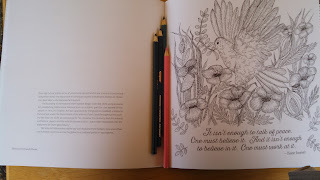 The book does not come with perforated pages as some coloring books are but I never take my pages out so I appreciate that they are attached. I want the pages to stay together in the book. Be sure to read the introduction in the first few pages of the book. 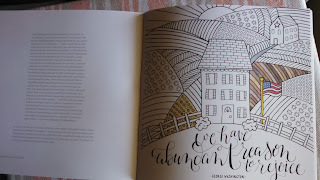 It gives some information about the book and ideas about coloring. Now onto some pictures! That's what you are here to see. 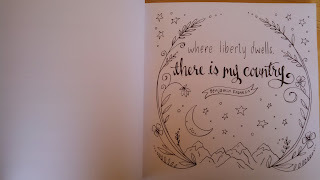 FTC disclaimer: I received this book from Blogging for Books for this review. All opinions are my own. Our family has been interested in ukuleles for the last several months. We attended a local festival a few months ago and took a beginning ukulele class. It was so fun! Buttercup is actually the one who was interested first. I've been taking her to a few free classes and I'd play along with her just for fun. Well on her birthday this year, she received a ukulele! She was so excited and has really took off learning everything she can. 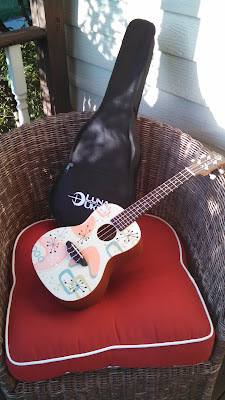 I was surprised last month with a ukulele of my own! I was not expecting one. I thought maybe in the future I'd buy one but my mother gifted me with a ukulele. I am now the proud owner of a Concert Luna Ukulele in Radioactive print. Now it's time to practice, practice, practice! I love how coloring has been enjoying a surge in popularity. It's an activity that I've never really stopped doing. 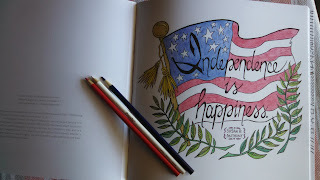 Coloring is a great way to spend time with kids or to do while traveling or to relax or keep your hands busy while watching TV. I still have many of the coloring books that I had when I was a little girl. While I enjoy adding some color to my Barbie Great Shape coloring book or my Little Mermaid coloring book, I'm really excited about all the adult coloring books available now. 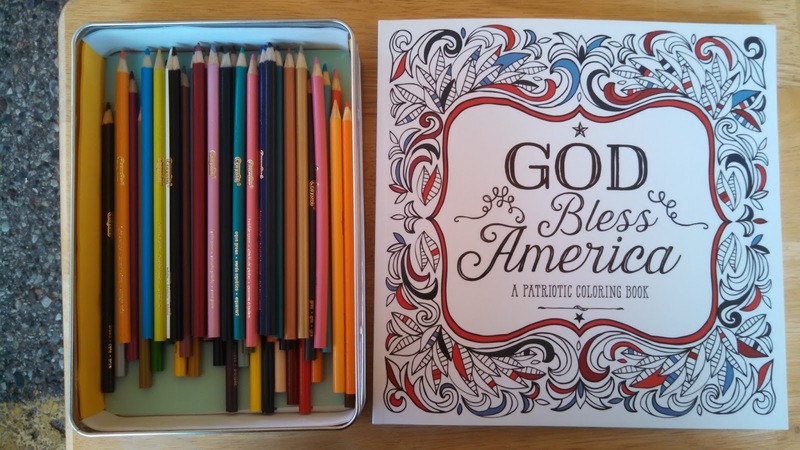 God Bless America: A Patriotic Coloring Book by Multnomah is a delightful coloring book that explores our nations history through wonderful illustrations. 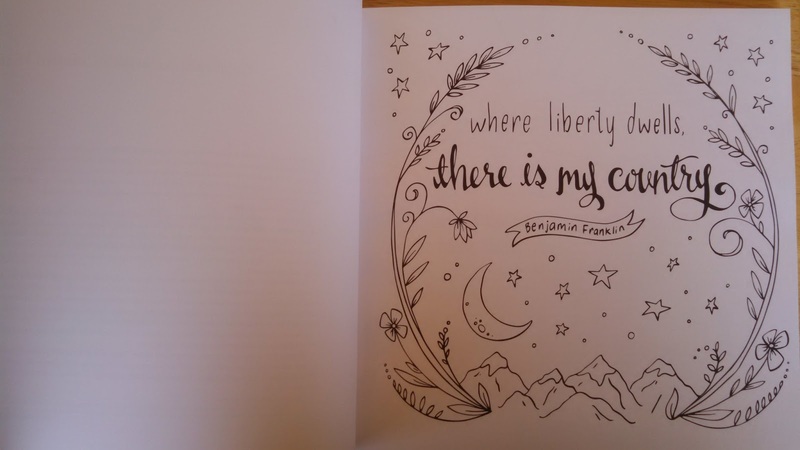 The illustrations include a quote from our Founding Fathers, a historic document, patriotic song, or scripture. This page features a quote from Benjamin Franklin, "Where liberty dwells, there is my country." And here is the illustration after I colored it. 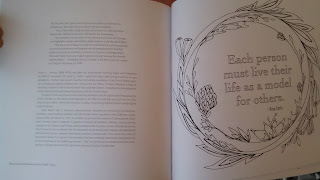 The backside of the drawings include informational text where you can learn more about that quote or song lyric. 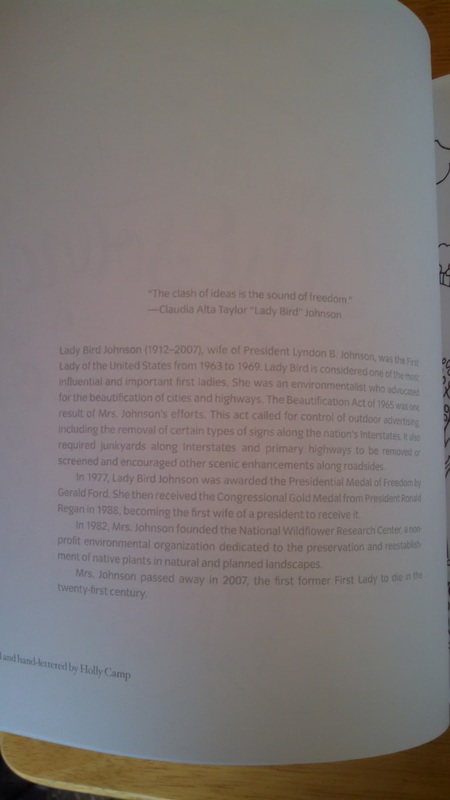 For example, here is the back page for Claudia Alta Taylor "Lady Bird" Johnson's illustration; it features her quote "The clash of ideas is the sound of freedom" and gives information about her life and things she accomplished during her lifetime. 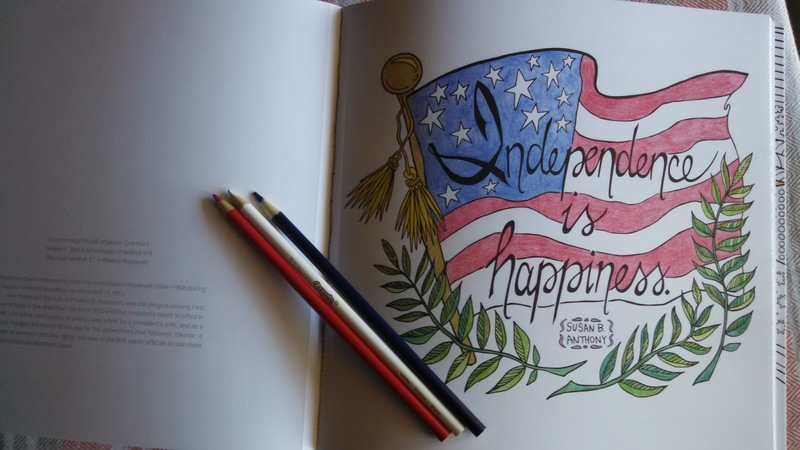 Here are a few more illustrations from the coloring book God Bless America: A Patriotic Coloring Book. 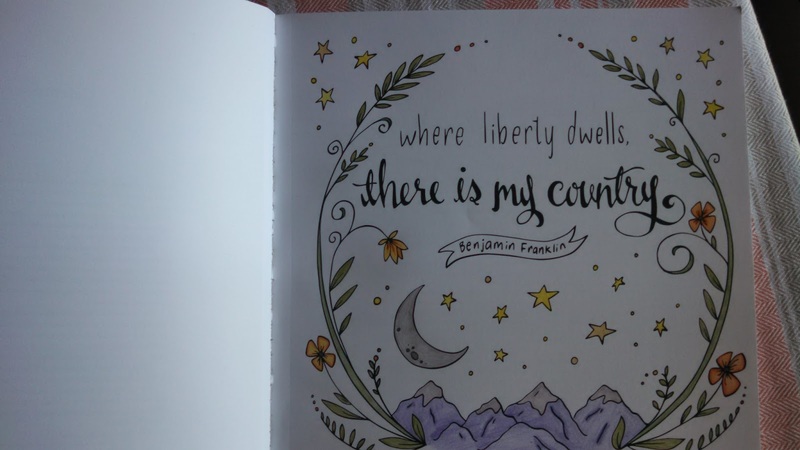 I really enjoyed being able to learn more about our great nation and it's history while also enjoying some quiet time coloring. 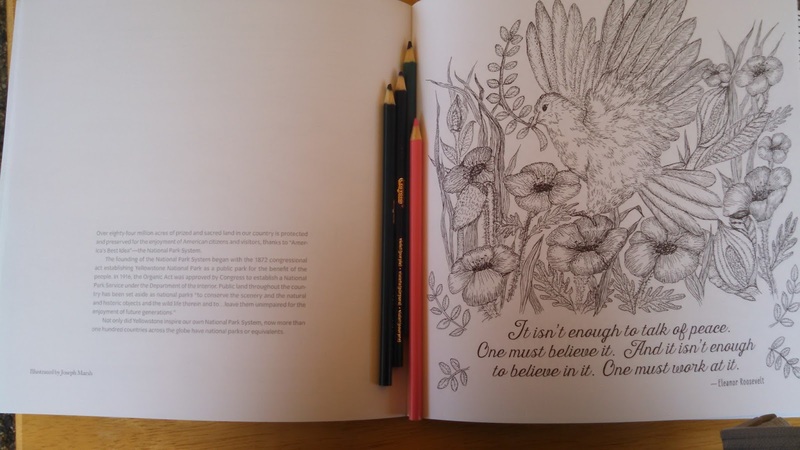 The pages are nice and thick and feature perforated edges if you'd like to take the pages out while coloring. 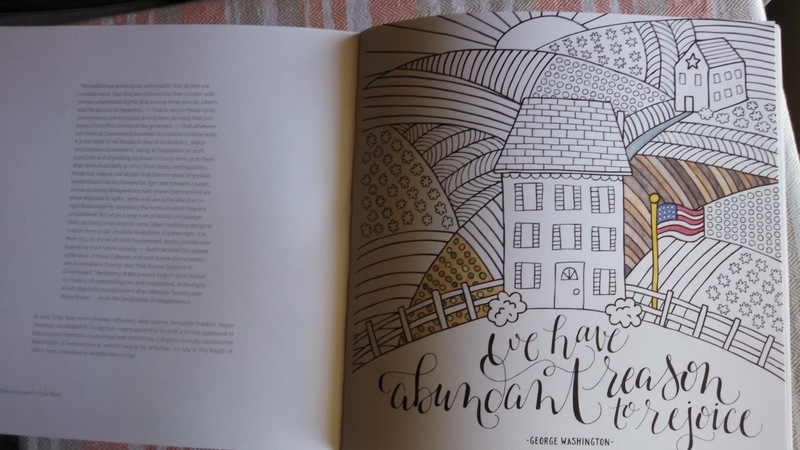 The back of the book features a playlist put together by WaterbrookMultnomah that you can listen to while coloring. 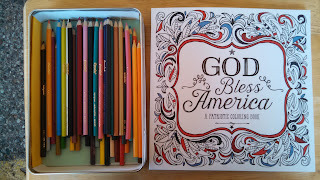 To access the playlist go to: https://spotify.com/user/waterbrookmultnomah and select the "Coloring America" playlist. 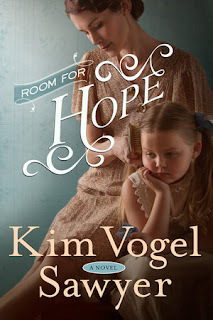 Room for Hope by Kim Vogel Sawyer is a story about learning to love and forgive even in the knowledge of betrayal. Warren and Neva Shilling and their 14 year old twins; Bud and Belle, live in Kansas in 1936. In the midst of The Great Depression, Warren and Neva work together to keep their mercantile in business. Warren sells his merchandise from a wagon to neighboring communities every other month while Neva stays home keeping the shop and their home above the mercantile running smoothly. Neva and the twins are impatiently waiting for Warren to return from his month long selling trip when they hear a wagon pull up outside. Hoping to find Warren home, they discover instead an officer named Jesse Caudel bringing news of the death of Warren Shilling and his wife, Violet. He wasn't alone. He brought with him Warren and Violet Shilling's three recently orphaned children who were to be put into the care of their Aunt Neva. Feeling humiliated and betrayed by Warren, will Neva be able to care for his children from another woman or will she send them to an orphanage? How will Neva's children respond to these three new additions and to the truth about their father? Will Neva be able to keep the mercantile open? Neva is forced to ask these and many other questions she had never planned. With many prayers and help from Jesse Caudel and her neighbor; Arthur Randal, she begins to find the answers. 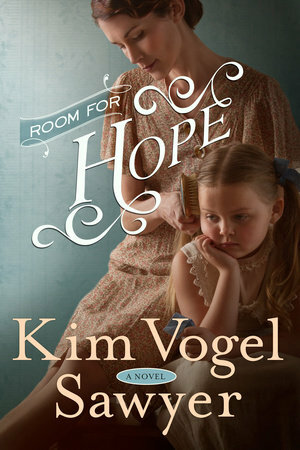 I enjoyed Room for Hope and wondered how Neva would handle the problems she was forced to face. Neva's character and how she questioned and reacted to different situations seemed true to life. 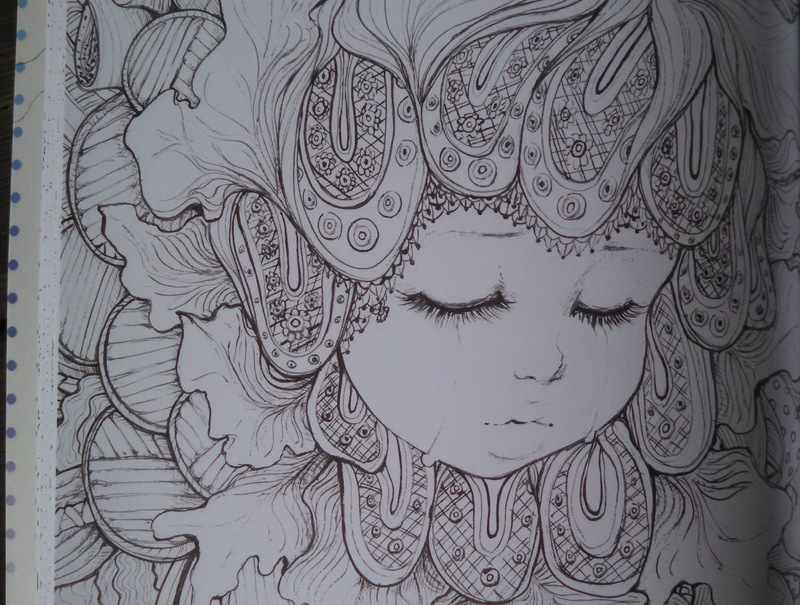 She felt anger, sadness, disbelief and gradually acceptance, hope and love. She faced all of her struggles with prayer and help from friends. The one character that seemed to annoy me was Bud. I understand that he was a young teenager dealing with the loss of his beloved father and the sudden appearance of three small children but his actions really annoyed me and seemed to be something a younger child would do. I managed to read through his sections to get to other characters that I enjoyed reading more. 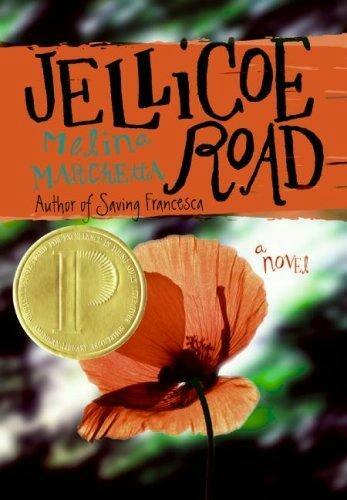 Overall, it was a great book about faith and learning to forgive those you love. This was the first book I've read by Kim Vogel Sawyer. She has won numerous awards for her faith based books. I look forward to browsing more of her books and hope you take the time to read a few of them. I'm so looking forward to Spring! Flowers, green grass and leaves and bike rides! 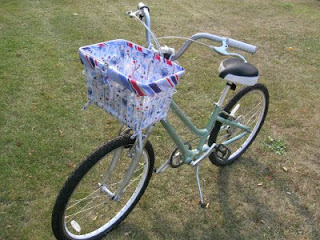 I'm ready to get my bike out of storage and start pedaling away. Are you pregnant and want to keep yourself and your family free of toxins? There's a new book out that will help you; Mommy Greenest Guide to Pregnancy, Birth & Beyond by Rachel Lincoln Sarnoff founder of MommyGreenest.com . There is also an ebook edition that you can read here: Mommy Greenest Guide to Pregnancy, Birth & Beyond ebook. 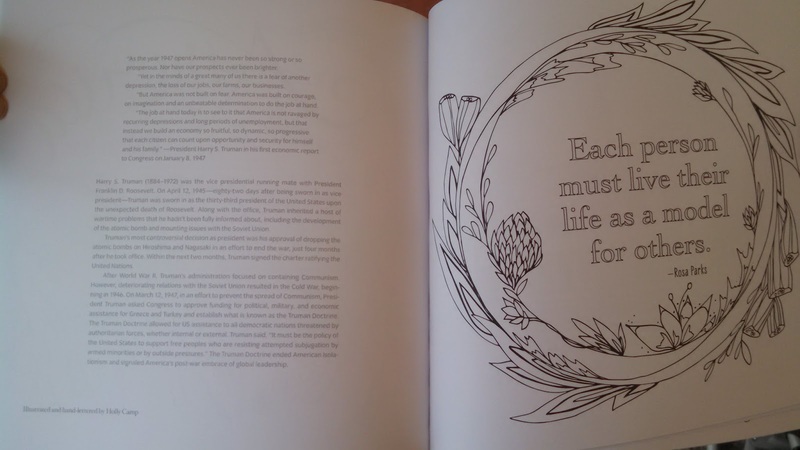 The book began as a letter to her children and grew into a book about creating healthy homes for our families. It's an easy to read format with great information, some DIY recipes, and advice. Creating a new person takes a lot of energy and resources from our bodies that begin with great nutrition and a healthy living environment. Take a moment to read through the book especially if you are planning for a pregnancy or even if you already have kids. It's never to late to start healthy habits. Naturepedic mattresses is one of the sponsors of the book. They create mattresses without flame retardants and toxic chemicals so you and your family have a safe and comfortable place to sleep. They even make crib mattresses and bedding. I'm so excited to find a great mattress company that is non-toxic. We spend so much of our lives in bed sleeping that I want to have a safe and comfortable place for me and my family to get that rest. I've been in the market for a new bed for several years (my mattress is extremely old and I'm embarrassed to even try to figure out how old it is) but it's so much work to find a quality, organic, chemical free, made in the USA mattress company and then find a place where you can test those mattresses. That's why it's been wonderful to find out about Naturepedic. They meet all of those qualifications and probably many more that I didn't think about and I can try out mattresses if I choose just by driving about an hour and half to a larger city in my area. Thank you Naturepedic for your commitment to quality and our safe, healthy sleep environments. Head on over to MommyGreenest.com to read the ebook or to purchase the book to get some great information about keeping healthy during pregnancy and beyond. Enjoy! One of the first baby carriers that I discovered when I began researching was Comfy Joey. Their slings are beautiful. I haven't actually tried one of their slings yet but I do have 2 of their children's doll slings. They are very well made out of quality materials. The girls loved playing with them. I love books! I love to spend my free time reading. My love of books began when I was very young and would walk or ride my bike up to the library. I could spend hours looking through the stacks of books. My current obsession is reading Young Adult or Junior Fiction books and mostly books with a dystopian theme. There's just something about YA and JF books that I love. I don't think I can put it exactly into words. So stop by your local library and take a look at the YA or JF section. You might be surprised by what you find. I love books. All kinds of books. Chronicle books has several fun books that I'd love to have. They currently are offering a Happy Haul-idays giveaway of $500 worth of books to a lucky blogger and a commenter from their blog and also a charity of their choosing. What a great giveaway! What books would you choose? Tell me something you'd pick for yourself and something you'd pick for someone else. And if I win don't forget that you'd get the same books that I chose. And for my charity, I'd choose to let my church, New Hope Community have the $500 to choose books for their elementary school classes. They could really benefit from some books since we currently have a very limited supply to work with. If you are in the Houston area and are in need of a doula or childbirth education classes, check out Birthin' with Love. Their next childbirth education classes begin January 8, 2011. Found a giveaway for an icomfort Serta mattress that ends tomorrow! I know short notice but I'm so glad I found it. I need a new mattress so bad! I can't tell you how often I wake up with numb arms or legs, a sore back and neck, and aching knees and hips. My mattress is so old and dips in the middle. I know several other people need some new mattresses as well, so I thought I'd share the info; even though I want to keep it secret so I can win. LOL! Welcome to Keeping My Fingers Crossed and the Ultimate Blog Party 2011! Come in and have a cupcake. Maybe a pickle? Which seems to be the favored snack around here. The girls would eat bowls of pickles all day long if I'd let them. Or maybe a pickle cupcake? I'll keep my introduction short since I know you are visiting lots of people today. I'm Lace, the creator, writer, editor, photographer, of this sometimes neglected blog. The cast of characters often include; my nieces Buttercup (6) and Pony (4), my mom, myself, and various other people. I write about many random interesting things including; crafting, my addiction to pajamas, my ♥ of the library, bike riding, and a few product reviews. If I'm not here, I'm editing your giveaway posts at Prizey. Which I have been fortunate to contribute and work at since it's beginning. Thanks for stopping by. I hope to see some of you visit again. Make sure to stop by 5MinutesforMom and join in all the party fun. Homefront (1991-1993) - Family drama that takes place after WW2 and how the family/town moves on from the war. I actually just discovered Freaks and Geeks and I'm loving catching up on all the episodes. I'll be sad when it's over in just a few short episodes. One thing I've noticed, I watch a lot of shows that seem to get cancelled after just one or two seasons. They are great shows, fun and quirky, or just plain awesome TV but for some reason don't get a huge audience and the TV execs give up on them. Much to the dismay of their fans. I'm so glad I can catch past episodes of many TV shows on DVD and great sites like Hulu. What shows do you miss? I'd love to find out if we have the same taste in shows or if there is a show I've been missing and need to go find on Netflix, Youtube, or Hulu. Our family has been thinking about purchasing a flat screen for our main TV in the living room. We do have a small flat screen in the kitchen. But what do you put your TV on? Hanging it on the wall is one idea I like. It would make a bit more floor space in the living room. But then what do you do with all the TV components? You know the DVD player, DVR, VCR (yes we still have one hooked up to our TV), stereo equipment and speakers. What's the solution for all that stuff? I guess you will still need some kind of LCD TV stand or cabinet system to store the extras in. Something like these 2 stands would be my first choice, maybe with the TV mounted on the wall above it. If you have a flat screen TV, do you have it mounted on the wall or sitting on a TV stand? And what have you done about all the extra stuff TVs require? I'd really love some ideas on the best way to organize my entertainment area without it looking cluttered. And how do you hide all the cords so they aren't hanging down the wall from the TV? I *puffy heart w/glitter* the library. I always have. I remember as a kid being so excited to ride my bike to the library to find something new to read. The library I visited as a kid is a Carnegie library that was opened in 1903 and in use until 1994. It's a beautiful brick and stone building that I've always thought would make a great house. One of my favorite features of the library was a curved stone staircase that led to the children's section in the basement. I felt like I was in a castle whenever I went down those stairs. I miss the old building; the worn front steps, the vault in the back, the wooden steps so kids could stand at the counter, and the bookmarks made from old wallpaper samples. I visit the library at least once a week and sometimes more. They have a great selection of books and if you can't find a book in the library our state has a great inter-library loan system, which I use often. They also have great programs. We've participated in several of them. Kid's reading programs in the summer, story times, zoo animal visits, library at the park, and tea parties. We attended a Fancy Nancy Tea Party recently that was so much fun. Buttercup and Pony love to visit the library with me and could spend just as long of time in there as me. Each time they visit, they check out an Elephant and Piggie book by Mo Willems. I usually have to keep them from checking out all of them. One thing about the library that I'm not sure you know (or maybe you do?) is that its a black hole where time doesn't exist. I enter the library, browse some books and choose the book I want. The next thing I know, I've been in the library for 2 hours! and it only felt like I was there for 30 mins. Does this happen to you? I once missed an entire class period in high school because I was so engrossed in my research that I didn't hear the bell ring for the next hour and I looked at the clock and had been in the library for 2 class periods. It happens to me all the time. I'm headed to the library today to pick up some more books. Show your library some love and go get some books. Who said: I would to get paula deen cookware in red! traciet, you have 2 days to claim your prize! I'm sending you an email right now. So please email me back our I'll have to choose a new winner. Thank you CSN for providing a great prize and everyone who entered. I had one duplicate comment (actually someone who posted 2 comments). So I ignored one of her comments and skipped it when I was counting to get the winner. Now that the Holidays are here and we have more family gatherings, I find that we need a few more places for people to sit. The floor is always good and that is where I tend to sit when there are no chairs left but not everyone can sit on the floor. Another option might be to use home bar furniture like bar stools. CSN has a great selection of bar stools and pub tables from modern to traditional to outdoor styles. I really like the shape of this bar stool. It's fun. I have a few friends that have pub style tables and I really like them. I like their height. This would be the table and chair set I'd choose. I think my style leans more towards simple clean lines with a bit of traditional in the mix. Actually, this set looks similar to our Amish made table and chair set we have now. You can find so much more at CSN's 200+ stores than you'd have imagined. I'm really loving this sandbox and think that we need to upgrade our plastic ladybug sandbox to this much larger and nicer box. Buttercup and Pony would adore this vanity and the standing mirror would go great in their room near their dress-up center. And I think that every kid should have an easel for maximum art production. If you remember, I reviewed a toddler bed last year and found CSN a great company to work with. 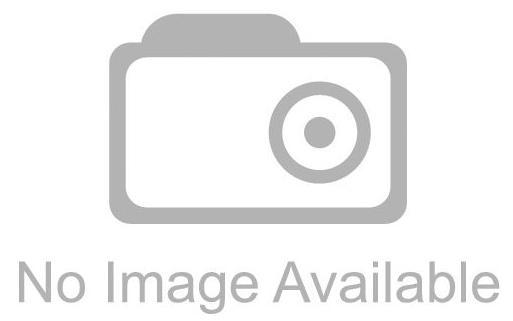 They have quality products and great service. I have a great surprise for you. CSN Stores has allowed me to offer my readers and guests an $80 gift certificate to their stores. I'm going to make this giveaway really simple to enter with just one mandatory entry question (which gives everyone one entry into the giveaway). Mandatory Entry: Visit CSN stores and leave a comment on this post with something you found that you think makes a great gift for a friend or family member. giveaway ends December 19, 2010 at 11:59 pm est. winner will be chosen using random.org sequence generator, first number listed is the winner according to comment order on blog post. winner will be contacted by email shortly after giveaway ends (or the next morning) and will have 2 days to respond (from time/date stamp on email) in order to claim their prize or a new winner will be drawn. please have your email available in your profile or leave it in your comment (if I can't send you an email, you can't win). And just because I'm curious, what do you use for extra seating? I was not paid to write this post and did not receive any compensation; however, I am a CSN preferred blogger and have received review products in the past. CSN stores offered to provide my readers with a giveaway. All opinions are my own. Skin MD Natural is hosting an amazing Fall into Cooking giveaway. You can win a ceramic cooking set and a years supply of Skin MD Natural. I don't know about you, but my skin is already starting to feel the cold snap of the wind with dry, itchy hands. And I could use some new pans. These are gorgeous! I'm heading over right now to enter, are you? The giveaway starts Oct. 23 and ends Nov. 20. To enter, visit the giveaway page at Skin MD Natural. Have you heard that your choice of how you carry your baby might be in danger? That is your choice on using carriers (ring slings, mei tais, pouch slings etc). The CPSC (Consumer Product Safety Commision) is going after all carriers warning that they are unsafe. The Baby Carrier Industry Alliance (BCIA) is working to create standards for carriers and promote education on the proper usage of slings. You can read the BCIA's mission statement and position here. 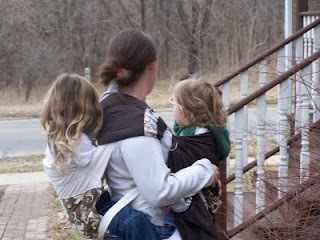 My love of babywearing began early in the year 2007. I didn't know anyone who used slings and didn't know of any classes in my area to learn from. I researched lots of information and styles of slings to see what was the best. I still wasn't sure if it was for me so I looked up patterns to make my own figuring if I didn't like it, I was only out some material and time. I created a pouch sling from a pattern I found at Karma Baby. A few months after that, I won a ring sling from Posh Papoose and I was hooked! My next purchase was a mei tai from Bloo Kangaroo which I love. I've made a couple more pouches for friends and received a few more pouches and ring slings. keep them close while in public. offer comfort and a cozy place to sleep. Anyone can use slings. I'm an aunt and use them to carry my nieces. My Mom has used them to carry her granddaughters. I've used them with friends' babies I was caring for. My Dad has even used them once or twice. Sadly, my babywearing days are currently on hold since the girls are getting so big. We've used the mei tai only a few times in the last year. If you have any questions about babywearing search the internet for any local classes near you. I would have loved to attend some classes and might in the future. I'd love to try wrapping next. Make sure to visit Stephanie at Adventures in Babywearing before Oct. 10, 2010 to see more stories of babywearing, get more information about the BCIA, and share your own story to be entered for a Sakura Bloom Ring Sling (which are amazing and I'd love to own).